“One time I lost my boa constrictor in my house for five months,” the man I shall call “Herbie” said. 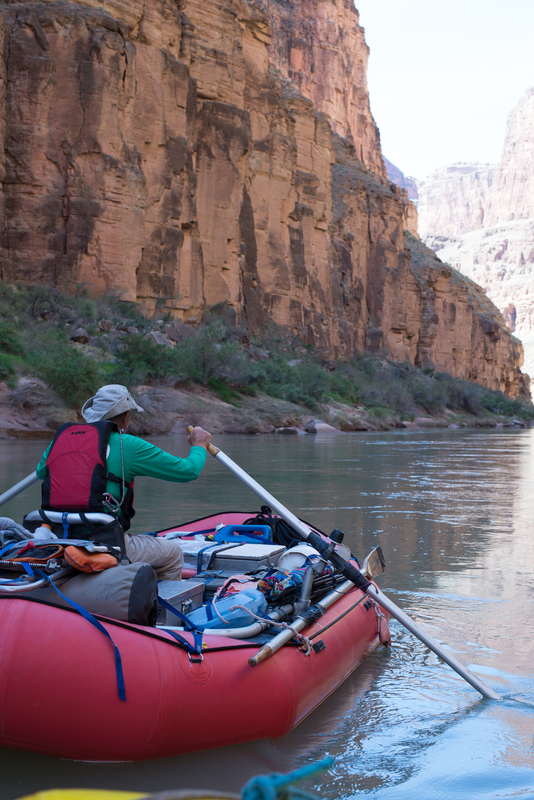 We were seated around an elevated campfire, the only kind the National Park Service allowed us on this nearly three-week river trip through the Grand Canyon. The campfire has to be in a firepan and it has to be up off the beach about 8 inches. Herbie was starting another boatman story the way most boatman stories begin. It was just an ordinary day, dot dot dot. But I paused in thought. Would I have invited Herbie on this trip if I had known that he not only kept a boa constrictor in his house but that he lost it for five months? I felt my eyebrows move together as I looked at the man. Every person on the trip will agree: Herbie is hands down, certifiably, unequivocally nuts. This guy had not struck me immediately as a wild card. I had been told that Jesus had saved him from drugs and other dark matter. I had been told he was crazy. But crazy man is not what I saw. Not really. I had met him in 2015 on a glorious 17-day trip through the same canyon. This sketch of Robert Duvall-but-better-looking wore one of two shirts at all times. Either a Kelly green jersey with “KAHANA” in block letters across the chest, or a photograph melded onto a t-shirt, a photograph of a surfer in his moment of ecstasy, riding a wave in brilliant blues and crashing white foam. These shirts topped brilliant purple shorts which graced sculpted hiker’s legs. On that first trip with Herbie he wore earbuds almost always. His half-open smile he often shared by gently moving in close and putting one of his earbuds in my ear. To share. I grabbed him and made him dance a few turns with me almost always. And he gracefully complied, but just for a few turns. Last year’s trip was different, comprising seasoned river rats exclusively. But my trip this year would have six Grand Canyon river virgins. And some had never been rafting anywhere. It was a different vibe. Herbie, in his late 60s, is set in his ways. He apparently lives part time in the Denver area, part time on Maui. What is he really excited about? His three dozen grandchildren. “I don’t carry a cooler,” the boatman said when I was trying to figure out where to load which meals on which boats for the 20-day 2016 trip on which I’d invited him. He would wear the same two shirts as last year. What? He doesn’t carry a cooler? Every boat carries a small coffin-sized cooler. It immediately struck me as a good way to get out of carrying a huge piece of very heavy group gear. But then I remembered he doesn’t drink. A multi-decade teetotaler who would not be tempted to do anything with our beer except throw it overboard. What would he say if I asked him to carry the beer—all 14 twelvepacks of it? He didn’t flinch. He found old drybags and loaded them up. We had a few slowpokes this trip and getting off the beach at 9:30 or 10 a.m. meant fewer layovers, which meant fewer hikes. Herbie was motivated to help and help he did. Herbie’s boat was ready to go every day shortly after breakfast so he’d see what needed to be carried down the beach to other boats and he would do it. And he never griped or complained or tried to get anyone to help. He just worked. Herbie said what he thought as always, but I never found it offensive, always delightful. But you can imagine how my point of view might not have been universal. For example, one day while we were sitting around in our campchairs devouring an excellent meal, a woman we will call “Tarn” commented about an interesting bird, one she either didn’t know lived in the canyon or she hadn’t seen before. Tarn was often commenting about birds or flowers or birds, often using Latin names, often more excited about it than most the rest of us felt was merited. On this occasion, Tarn commented about a bird just one too many times. Herbie just couldn’t take it any more. At the expense, perhaps, of my friendship with Tarn, I exploded in laughter. This guy is a redneck through and through, I thought. I am an atheist, he is a born again Jesus worshipper. He is right wing, I am left. He likes raw cabbage with French Dressing, I like real food. But damn I love this dude. I’m not sure Herbie feels the same way about me. In 2015 I asked the group if anyone wanted to hike up to Newspaper Rock, a long hike from an upper section of the river to an undocumented native American petroglyph. He clearly didn’t believe it actually existed. But when a witness who dared the goosechase with me returned several hours later to confirm, Herbie pulled out his topo maps and tried to ascertain exactly where it could be found—for future reference. This year he questioned me in detail and set off with two other sturdy hikers. They returned that evening, exhausted but victorious. Yup, with Herbie you have to earn it. And Herbie has to earn it with me too. Last year on a layover at Stone Creek hikers were setting out in ones and twos for a several-mile hike up to some waterfalls. My companions could not be found so I figured they’d left while I had been washing my hair in the river. So I started up the trail alone, noting that others who wanted to hike were still busy in camp. But I was eager to set off so I did. In less than a mile I encountered a rattlesnake smak-dab in the middle of the trail, rattling away at me. After calming my pulse I tore a page from my journal and jotted a hasty note to the others behind me. “RATTLESNAKE 10 FEET AHEAD” and I place it under a rock where it could not be missed, with the word “RATTLESNAKE” clearly visible. When we met up a few hours later at the base of the waterfall, those behind me thanked me for the warning. Then Herbie descended from his hike farther up. “Hey did you see that cool snake?” he asked. He paused in pure virgin innocence. “I didn’t have a paper or pencil,” he said. Of course he didn’t. And that’s not his style anyway. I suddenly felt sorry I’d mocked him. He just doesn’t think that way. But not me. If I’m a girl to him, I’ll be a girl. What could be offensive, really, about that? Innocence? Naivete? Lack of higher education? I’m good with that. “I finally tore the house apart. I searched EVERYWHERE,” Herbie was finishing his story, making the universal referee signal for OUT. “Except the washing machine,” he said, in a quiet, dramatic voice. “No, not in the tub. I took that washer apart and there he was.” The boa constrictor had been in there for months. Next time I get a permit, Herbie will be at the top of my list.